So how wide should the door be opened? This raises deep questions about what constitutes a University. Currently, British Universities have a strong international reputation. Historically, they have been subject to strict scrutiny in return for receiving government funding. They combine research and teaching to push forward the boundaries of knowledge, and have trained students to value knowledge for its own sake, not just as a means to an end. Not everyone wants that kind of education: some students do not enjoy formal academic study and may prefer vocational courses or apprenticeships. It is important that our higher education system caters for them. The question confronting us now is how far we should extend the definition of a University. 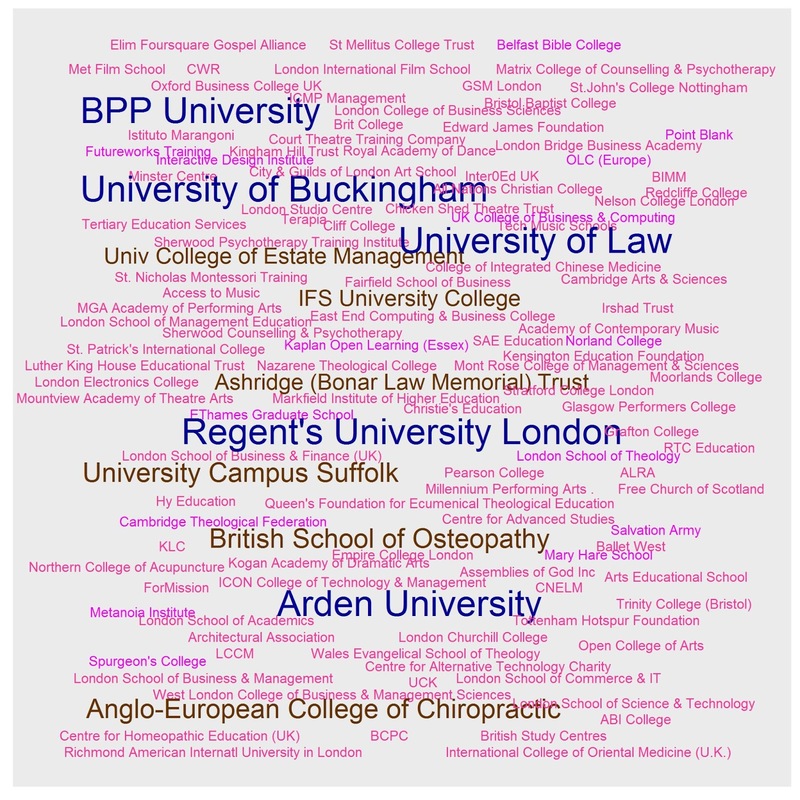 It is interesting to consider the Word Cloud I made of ‘alternative providers’, shown in Figure 1. Figure 1: Alternative providers from http://www.hefce.ac.uk/reg/register/getthedata/. Key: Blue have University Title; Brown have Degree-Awarding Powers; Pink offer designated courses; Violet deliver HE as a franchise only. Taken from http://cdbu.org.uk/speedy-entrances-and-sharp-exits-letting-in-more-alternative-providers/. Among those listed are six institutions providing training in various forms of complementary and alternative medicine. Two of these had progressed to the point of having degree-awarding powers, which is one step below having University Title. Let us be clear: the subject matter that these institutions teach is not endorsed by serious scientists. David Colquhoun highlighted a worrying trend for UK Universities to give degrees in ‘anti-science’ back in 2007. In Australia, where chiropractic has been taught within the regular University system, it has come under increasing attack by scientists, who note that by awarding degrees in these subjects, one gives credibility to procedures that are placebos at best and dangerous at worst. Are these concerns just a sign of anti-competitiveness and elitism? Are scientists trying to squeeze out the alternative providers because they think they’ll poach students from them, just as McDonalds might try to ensure that Byron Burgers are denied space for development? I’d argue not, and furthermore that Jo Johnson’s analogy shows a startling lack of understanding of what a University is all about. Medicine has had many false leads and it would be the height of arrogance to assume that what we know now is the only truth. But the difference between medicine and alternative medicine is not just that there is evidence for effectiveness for medicine; it’s also that in medicine there is a continuous movement to develop and improve theory and practice, rigorously testing and debating ideas and using scientific methods to evaluate them. It’s difficult to do this well and it often goes wrong, but there is broad agreement about the importance of evidence. Well, you might say, what about religion, another topic that features heavily among alternative providers? Should theology be banned from Universities because it is not evidence-based? The answer is no, and for similar reasons to those given above: the difference between our traditional Universities and the new providers is that Universities teaching theology consider a range of perspectives and teach students critical thinking. You do not need to be a believer in any God to study theology. In contrast, new providers are often narrow in their focus: many of those with religious affiliations look as if they train students in one religious viewpoint and one only. Defining the difference between what is suitable and not suitable for inclusion in a University degree course is itself an interesting intellectual exercise. We should not assume that something is good just because it already exists, and is bad if it is new. But if we just ignore this distinction and have a free-for-all whereby anything can be regarded as higher education provided that there are students willing to pay for it, we will end up with a system in which the terms University and Degree will count for very little, and where the survival of a higher education institution has more to do with its marketing skills than its academic standing. In the past, there were few institutions clamouring to become Universities because it was not easy to make a profit from Higher Education. That has all changed now that higher education providers can get their hands on money from the Student Loans Company. Experience to date suggests we need to have more, rather than less, scrutiny of alternative providers in the current financial climate. One final point: the alternative providers I have discussed here could do very well on the Teaching Excellence Framework (TEF), which will rate higher education institutions according to three main criteria: student satisfaction, drop-out rates and employability. Indeed, if they recruit their students from among disadvantaged social groups, they might well achieve higher TEF scores than more selective institutions, because benchmarking is used to adjust the outcomes. 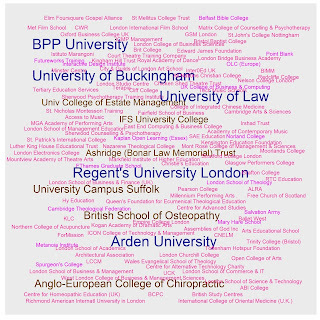 So under Jo Johnson’s oversight, we could end up with a situation where the quality of teaching at the Anglo-European College of Chiropractic is deemed superior to that at the Universities of Oxford and Cambridge. An interesting thought. Anyone thinking that education should be some kind of free market has to be a)a total idiot, b)an economist (actually b==a often occurs) c) a Conservative. I suspect Adam Smith's ghost is weeping. One just has to look at the meltdown of the American educational system with it's charter schools and its various Value Added Measure systems (http://vamboozled.com/) to see introducing the kind of competition that Johnson is an excellent way to destroy the system. Although one restaurant does not have to apply to another restaurant in order to serve the public, they both have to comply with national hygiene requirements. We need to specify what constitutes a university. I look forward to the number of universities being cut. I agree with most of your arguments, still the McDonald's-Byron analogy does carry some weight. It is a curious system where participants in a market have the power to decide whether new entrants are allowed. Why not delegate this task to foreign academics who have no conflict of interest?